You probably season your food with olive oil and salt, but did you know both of these food items have major skin benefits too? Olive oil has been used for centuries to moisturize skin and hair. Olive oil contains many powerful antioxidants like phenols and vitamin E. Phenols are antioxidants that help get rid of free radicals that could cause disease and even cancer. Vitamin E helps keep skin healthy and can especially help keep your skin moisturized, less red and swollen after being in the sun. 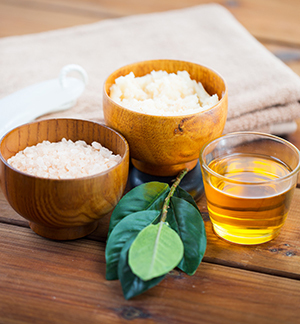 Salt scrubs are also great for your skin because they exfoliate gently. Exfoliation is key to skin to keep it smooth and get rid of dead skin cells that can clog pores. Clogged pores can lead to blackheads, whiteheads, acne and other various skin woes. For all of the benefits of olive oil and salt scrub on your skin, try this scrub that you can easily make at home. Mix a ¼ cup of salt with a ½ cup of olive oil until it is a thick paste. Apply in the shower on any area you need exfoliation and moisture in circular motions. Then rinse. Your skin should feel silky smooth when you’re all finished. Wrap up your skin care routine with lotion on damp skin for extra moisture benefits. Have you ever used olive oil and/or salt on your skin? Have you seen the benefits first hand? Share with us and send us your before and after photos! We would love to see if this works for you!